Having a tasty dip recipe is a must during the season for warm weather get-togethers! 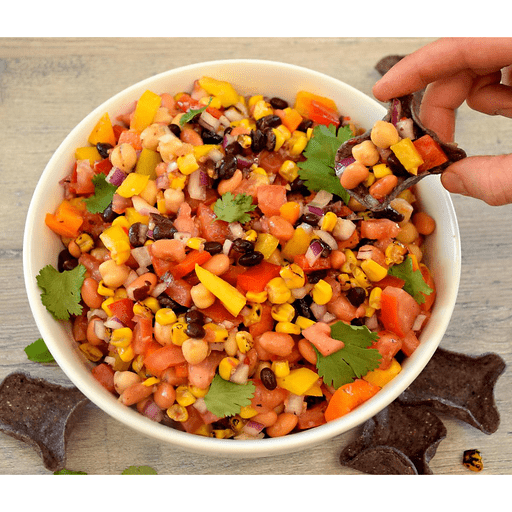 This Texas Caviar dip comes together in a snap and is packed with veggies like roasted corn, pinto and black beans, chickpeas and bell peppers. 1. In a large bowl, combine ingredients through Italian dressing. Toss to coat. Allow to marinate 1-2 hours or overnight. 1. Add diced tomato and chopped cilantro to mixture in bowl. Season with salt and pepper to taste. 1. Serve with tortilla chips. Calories 160, Total Fat 5g (Saturated 0g, Trans 0g), Cholesterol 0mg, Sodium 340mg, Total Carbohydrate 22g (Dietary Fiber 4g, Sugars 5g), Protein 6g, Vitamin A 10%, Vitamin C 100%, Calcium 4%, Iron 4% *Nutritional values are an approximation. Actual nutritional values may vary due to preparation techniques, variations related to suppliers, regional and seasonal differences, or rounding.